With the nice chilly fall weather coming in to take away that blistering summer heat, it is finally time sit by the fire with family and friends. Whether it’s a fall cookout, a family gathering, or a quiet night with a few close friends, fire pits are a go-to option for those looking for a nice cozy time. What few people realize is that a fire pit and the area around it can be designed in many ways, some even turn out to be a truly unique centerpiece for a beautiful yard. Wood burning fire pits are the classic standard and offer a variety of benefits. First of all, they have the capacity to produce larger flames and therefore more warmth – a great benefit when it gets really chilly in the later parts of autumn. In addition, when cooking, the smoky flavor is produces makes this your best option. Wood burning fire pits come in various styles. They can be in ground or above ground, and many can often be built with natural stone. Other styles, like the chimenea, Spanish for chimney, has a classic fireplace feel and is usually made of terracotta or metal. Chimeneas are good for adding a more rustic look to your yard and for controlling the direction of the smoke. However, they have less space for cooking and since much of a chimenea is enclosed it blocks the fire’s heat. When entertaining keeping your guests comfortable and relaxed is always the priority, and seating is the most basic part of that. Of the many options for outdoor seating that are available, patio furniture gives you the best vehicle for finding what fits perfectly in your yard. Outdoor seating is also movable, which is great for guests sitting by the fire since they can control how warm they are. Another great seating option is a retaining wall. Not only does it help with retaining soil, but it can also double as seating for your guests! 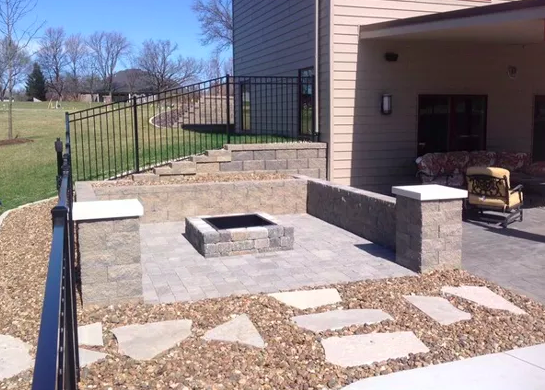 In terms of design a fire pit can be built near an existing retaining wall, or vice versa. Another option is to use a portable firepit, such as a chimenea or a copper fire pit, and move it as close to the retaining wall as necessary to keep cozy. Also, if you want to spice up your guests’ pictures, consider planting flowers just behind the seating – they’ll have something beautiful to look at with a soothing fragrance while they relax next to the fire! Food is just as important as seating when entertaining guests, especially when you know your gathering is a long one! Luckily fire pits are perfect for cooking a wide variety of foods. For a classic fall favorite, you and your guests can make some s’mores. You can either do this in the traditional way, or you can purchase a s’mores maker. These are widely available and come in versions that make a single s’more or even up to six at once. If you’re looking for a savory snack option a popcorn popper is perfect. These can often be found at camping, fishing, or outdoors stores. If your guests or gathering needs more than just snacks you can’t go wrong with grilling some meats and/or vegetables. A grill grate can easily be purchased or even made and placed over the fire. For those that are aficionados of grilling, or like to explore the depth of flavor this can add to food, different types of wood can be used. Common woods used for this include oak, cherry, and hickory. Often you can purchase these in the form of wood chips to add to your fire as necessary. Grilling isn’t the only way to cook on a fire pit. Consider inviting your guests over for a fire pit brunch! With a reversible cast iron griddle, a cast iron waffle iron, and a percolator, you have all the tools you need to make a great breakfast while enjoying your amazing yard. Ready to start planning your yard with a fire pit for entertaining guests? Give us a call at (636) 688-6647, we love doing custom work and will happily design something that works perfectly for you.